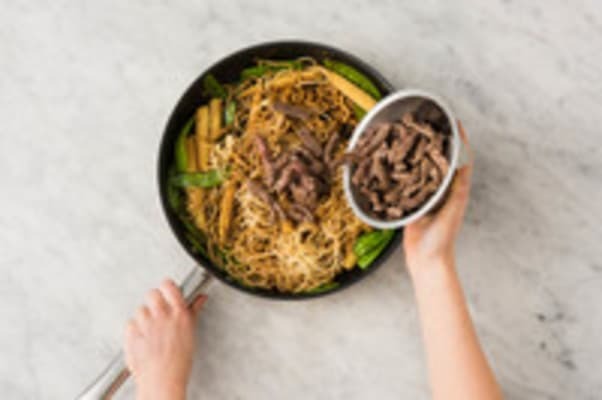 What could be more satisfying than a one-pan wonder stir-fry? 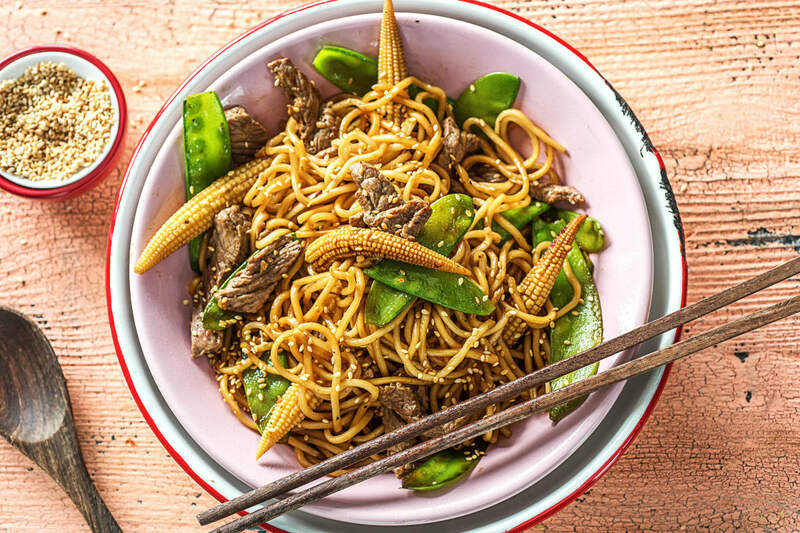 From the quick fry beef strips to the tender crisp snow peas, this dish comes together in a flash with a balanced Japanese soy-mirin sauce and the ever popular hearty yakisoba noodle. Topped with aromatic toasted sesame seeds, this weeknight dinner is sure to become a favourite! Wash and dry all produce. 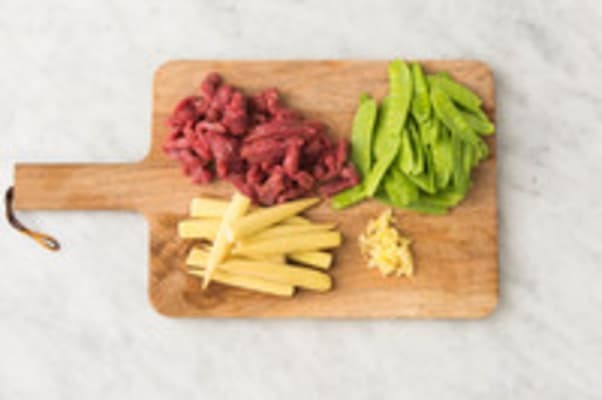 * Mince or grate the garlic. Drain and rinse the baby corn. 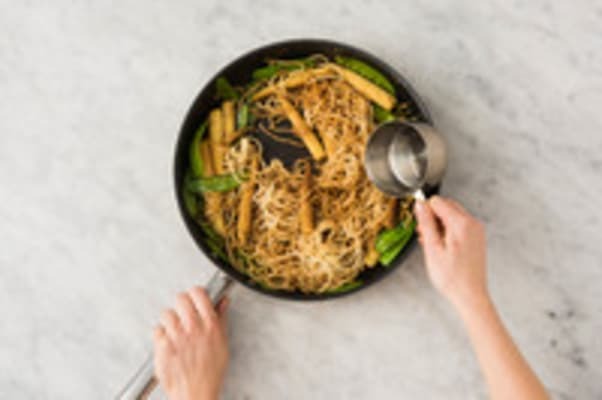 In a large bowl, soak the noodles in hot tap water (this will help separate the noodles). 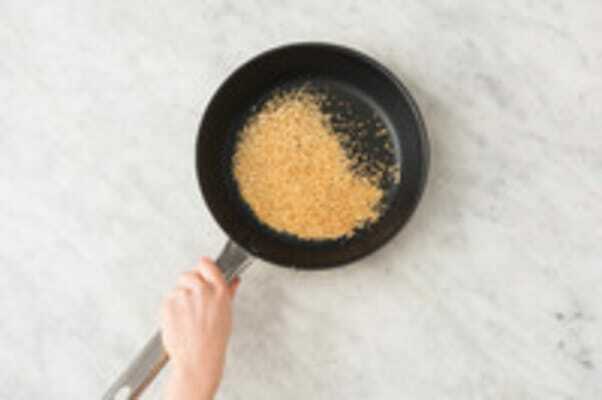 Add the sesame seeds to a cold, large non-stick pan. Heat over medium-high heat and toast, stirring often, until golden-brown, 3-4 min. (TIP: Keep your eye on them so they don't burn!) Transfer to a plate and set aside. Pat the beef strips dry with paper towels. Season with salt and pepper. Heat the same pan over medium-high heat. Add half the sesame oil, then half the beef strips. Cook until browned, 1-2 min per side. Transfer to a plate. Repeat with the remaining sesame oil and remaining beef. Decrease the heat to medium. Add a drizzle of oil , then the snow peas and garlic. Cook, stirring occasionally, until the snow peas are tender-crisp, 3-4 min. Drain the noodles. Add the noodles, baby corn, soy-mirin blend, sweet chili sauce and 1/3 cup water. Cook, stirring occasionally, until the noodles separate, 3-4 min. 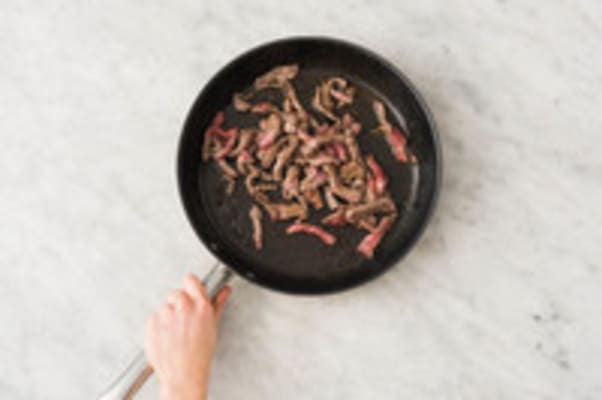 Add the beef to the pan and stir together until warmed through, 2-3 min. Season with salt and pepper. 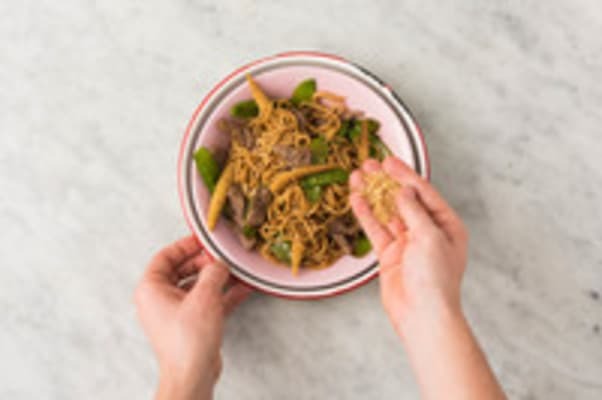 Divide the stir-fry between bowls and sprinkle with the toasted sesame seeds.